Looking for a quick-quinoa recipe that can make a meal?? Check out this Quinoa and Smoked Tofu Salad from eatingwell.com. A simple, nutritious dish that provides all of the components of a complete meal: hearty grains, lean protein, and plenty of veggies! Do you like mac & cheese? Try this super simple and better-for-you Salmon Mac & Cheese. With extra veggies, less cheese, and omega-3 packed salmon, this is a quick and easy week night meal that will leave you feeling satisfied! Sunday Funday- Simple & Healthy Solutions to your Favorite Football Foods! Looking for some easy to prepare recipes for your Sunday Funday? 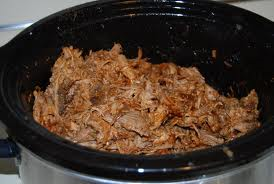 Bring out the slow-cooker and try this super simple Pulled-Pork recipe. 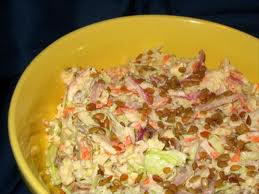 Of course, you will also need a side of coleslaw! With a total of about 20 minutes of prep-time for these two killer recipes, you wont need to worry about missing a minute of the game! Spray the bottom of your slow cooker with cooking spray. Place pork in bottom. Sprinkle with seasonings. Spread applesauce evenly over pork. Drizzle with BBQ sauce and Worchester sauce. Cook on high heat for 6-7 hours. Using two forks, gently pull pork apart to shred. In a medium sized bowl, combine all wet ingredients and seasonings. Mix well. Add in cabbage and carrots. Stir until veggies are all coated. Sprinkle with sunflower seeds. Cover and refrigerate at least 1 hour before serving. Looking for simple and delicious soup? 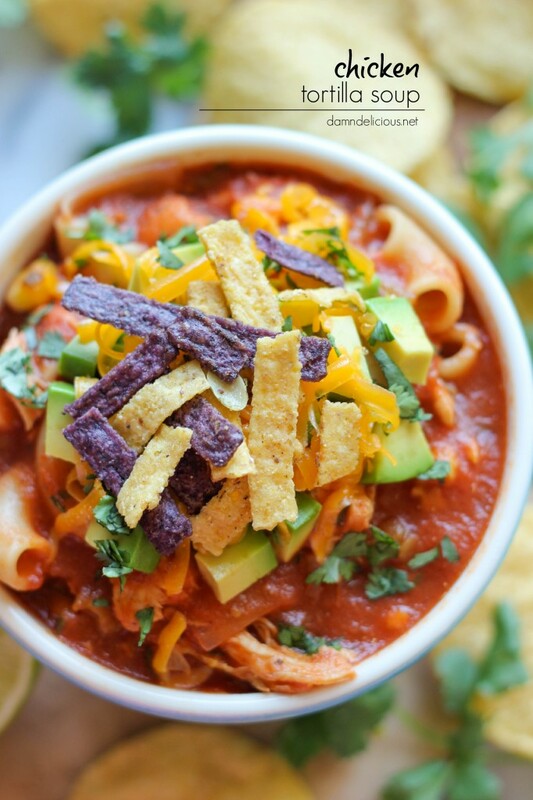 Try this quick and easy Chicken Tortilla soup! Per serving this soup has 3oz protein, 1/2 serving grains/starches (when served with 5-7 tortilla chips), 1 serving vegetable, 1 tsp fat/oil. Heat olive oil in a large stockpot or Dutch oven over medium heat. Add garlic and onion, and cook, stirring frequently, until onions have become translucent, about 2-3 minutes. Stir in chicken stock, crushed tomatoes, green chiles, chili powder, cumin, oregano and cayenne pepper; season with salt and pepper, to taste. Reduce heat to low; simmer, covered, until thickened, about 15 minutes. Stir in pasta, chicken, corn, cilantro and lime juice until heated through, about 2 minutes. 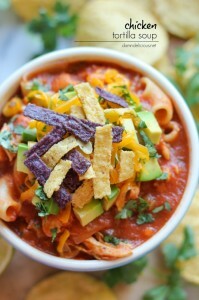 Serve immediately, garnished with avocado and tortilla strips, if desired. I don’t have enough time to workout during the week…..